Lice, lice and more damned lies. This last year the pro-salmon farm lobby have repeatedly told us salmon farming’s the economic salvation of coastal communities. Meanwhile, Save Bantry Bay and others have expressed serious concerns that it will be both environmentally and economically disastrous for these areas, destroying fish stocks, water quality, angling and tourism businesses. It seems we might be about to find out. Following a Freedom of Information request by Friends of the Irish Environment, the Ombudsman is opening an investigation into possible malpractice by the Department of Agriculture. It would appear they withheld information from the European Commission during an investigation into the impact of sea lice from salmon farms on protected wild salmon. The European Commission is also considering re-opening the file, after receiving the same dossier of information. But that is not the only fishy issue. Central to this story is Minister Simon Coveney’s agenda to increase Ireland’s farmed salmon output at an unprecedented rate. His plan is for Bord Iascaigh Mhara to develop a series of gargantuan salmon farms around the coast. The first, in Galway Bay, would alone double Ireland’s farmed salmon production in one fell swoop. Unsurprisingly this proposal for has met with considerable opposition. Much focussed on the impact of sea lice from salmon farms on wild salmon. Quick to respond to the on-going objections, BIM contracted a top marketing agency and the big sell began. Soon came BIM’s and the pro-salmon farm lobby’s next big trump. The publication of a series of research papers by the Marine Institute which claimed the exact opposite to all other research to date – sea lice from salmon farms do not have a negative impact on wild salmon. One paper claimed quite the contrary, stating there are more thriving salmon rivers in areas near fish farms than elsewhere. It didn’t take long for BIM, the Irish Farmers Association and the pro-salmon farm lobby to be using words like ‘definitive’, ‘conclusive’, ‘unequivocal’ when quoting these studies. Now, all such claims have ceased. Instead a very obvious silence reigns. Why? The Marine Institute’s research has been rubbished by an international team of experts. It turns out that rather than showing sea lice have no impact, their data in fact shows they’re detrimental to the future of wild salmon. 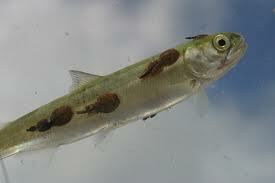 When the international team re-analysed the figures using more accepted methods, it proved sea lice are in fact causing a one third decrease in nearby wild salmon populations. A figure that is almost identical to what other research studies found. Given the backbone of the argument for the Galway Bay salmon farm was the Marine Institute’s research findings, BIMs silence in particularly is profound. For it is now clear, if the mega farm goes ahead, some of Ireland’s most famous salmon runs, such as the Corrib, will be at risk of collapse. So it seems that the Marine Institute, a government agency whose responsibility is impartiality, is happy to produce bad science specifically to support a particular government Minister’s policy. Their reputation lies in tatters. To make matters worse, throughout this, Inland Fisheries Ireland (IFI), scientific experts and environmental groups have been attempting to warn Minister Coveney that he is being misled. Their voices have been quickly shot down, with the response that the Marine Institute’s research has given the final answer. Simon Coveney did not want to listen. Even more deceit lies in the fact that during this entire period, there was supposed to be a moratorium on the expansion of salmon farming. Only a few years ago, the government recognised the sea lice problem and had taken action to solve it. The 2010 strategic environmental assessment of the National Development Plan, found that ‘targets for increased productive capacity of salmon will… have to be deferred until after 2013… until such a time as the sea lice issue has been satisfactorily resolved’. Amazingly, these conclusions were based on advice from the Marine Institute, amongst others. Records show the Marine Institute stating ‘clear scientific evidence’ that ‘lice emanating from the farms can adversely impact wild migratory salmon’. On 22 July 2010 the moratorium was signed off. From that point on government funding for salmon farming was to be frozen. Yet, only a matter of months later Minister Coveney ordered BIM to initiate the programme for a chain of mega-farms around the coast. Adding insult to injury, soon after €1 million of government money was given to the so called ‘deep sea’ salmon farm programme. The first ‘deep sea’ farm being the very one proposed in Galway Bay less than a nautical mile from land. So the government was now not only initiating but also funding salmon farms in direct contravention of the agreed course of action. It was when the mega ‘off shore’ salmon farm idea came about that the Marine Institute changed their sea lice tune. Charged with preparing an Environmental Impact Statement for the first farm in Galway Bay, they were now working hand in hand with BIM. To get the salmon farm through the decision making process, it would be vital to have research showing it would not be detrimental to wild salmon. It was not long after that the new research ‘findings’ were published. For a while it looked as though there was going to be no stopping the salmon farming agenda… Until now. Today, this unstoppable machine looks like it might be derailed. With the Marine Institute’s research dismissed, the European Commission considering the re-opening of its case, and the ombudsman opening an investigation, the ‘truth’ may finally emerge.